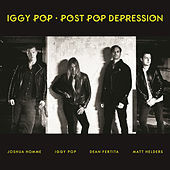 At first blush, the Josh Homme-produced Post Pop Depression sounds decidedly more crafted and measured than Pop's blistering reunion efforts with The Stooges. The album finds him relying heavily on mood and atmosphere rather than raw power, but once your ears grow accustomed to Pop's exquisitely murky delivery, it becomes all too clear the singer continues to commune with the same shadowy spirits that always inspired him. "I'm a wreck -- what did you expect?" he sneers on the darkly funky "Sunday." Meanwhile, "Gardenia" is a downright ominous love song throughout which Pop moans and coos as though he were a delusional stalker. Hooking up with Homme was an ace move: Homme’s knack for oddly structured alt-rock blends well with Pop's eccentricities (a great example is the Western-flavored "Vulture"). Moreover, Homme was responsible for putting together the versatile backing band, which in addition to himself includes fellow Queens of the Stone Age Dean Fertita on guitar and keys and Arctic Monkeys drummer Matt Helders. The result is one of the most rewarding solo records of Pop's career. 2016 IGHO, LLC Under exclusive license to Loma Vista Recordings. Distributed by Concord Music Group, Inc.